At the end of the race me and several other runners found that we couldn’t remove our shoes because they were frozen to our feet. As I sit here writing this nearly 3 hours after finishing the race I’m still unable to feel 2 of the toes on my left foot. They’re numb, completely numb. To my adjoining toes they feel like something in my sock that shouldn’t be there. A very odd sensation. All part of the fun. 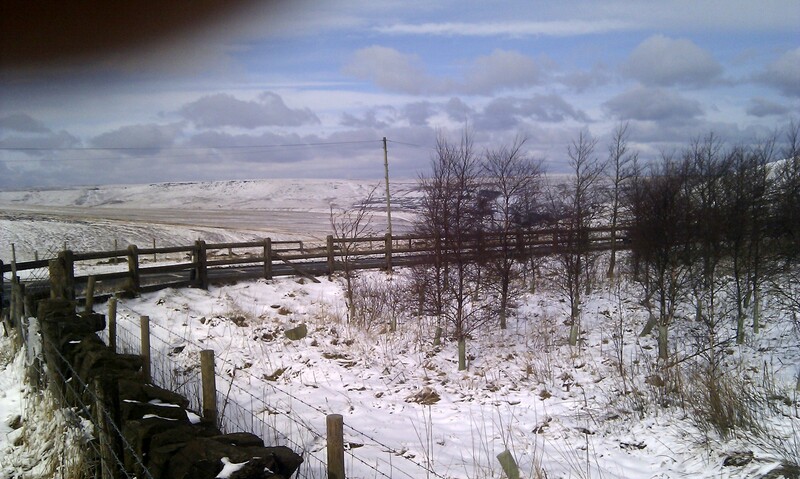 It was a bleak night but I didn’t expect to wake up to hills covered in snow this morning. This should make it interesting. There were already many tales being told in Marsden Cricket Club (race HQ for the Ian Robert’s) of the various adventures people had already had getting there this morning. 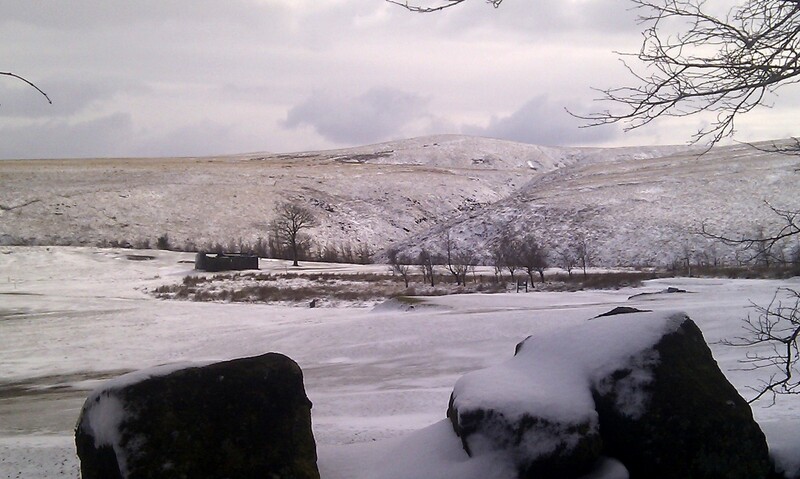 With dark skies, high winds and snow showers we might well be in for some more. 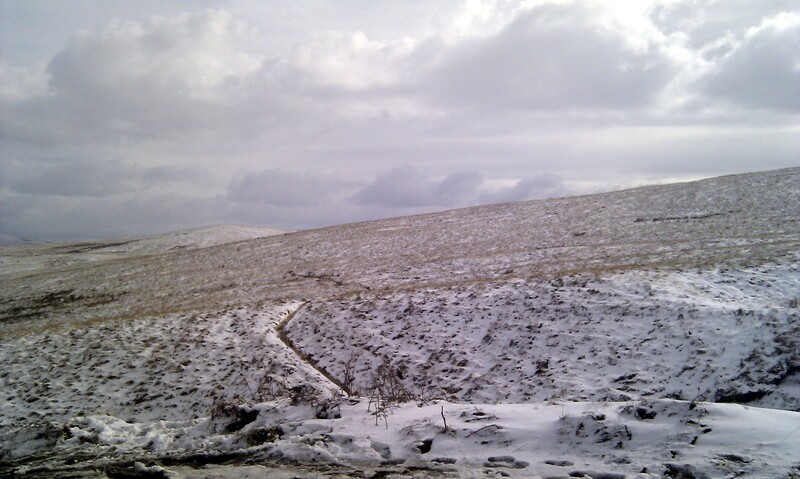 Was I really going to spurn the warmth of my insulated coat and head up the hill? Of course I bloody was. I made my way up to the start with fellow Peak Bog Men Stephen (Diver-Driver) Fraser and Alistair McDonald. I’m pretty sure comedy starts to fell races that begin in Marsden are quickly becoming the way things are done round here. We’ve already had what’s been termed ‘The Keystone Cops start’ to the Trigger earlier this year. Phil Hobbs stepped up to the ‘starting mound’ to do the housekeeping and start the race. One hundred and five fell runners primed and ready to go, eagerly staring up the track waiting for the countdown. When…”Is that a car …coming towards us?” Up pootles a rather surprised looking farmer in a pick-up truck carrying a huge bale of hay. One hundred and five fell runners now find themselves clambering off the track to find enough space to let him through. Normal service was soon resumed and we were off. I’d decided to go for a fast start (for me anyway) up to the footbridge after the first road crossing. It was fun. Keeping up with the faster runners and jostling for position as we raced along the track. I forgot to slow down after crossing the bridge though and got dragged along at a pace much quicker than I’m comfortable with. By the time we hit the first ascent of Bobus I was knackered. I arrived at the top having only lost 3 or 4 places but now expected to lose more on the section around the catchwater leading to Black Moss. I didn’t so was quite pleased and feeling the recovery from the quick start and ascent was going quite well. I looked up to see everyone crossing the bog at the same place – usual in snow when it’s easier to see and run in a broken trail. I decided they were all sheep-like idiots and that I could pick off a least half a dozen by blazing a much more efficient trail of my own. 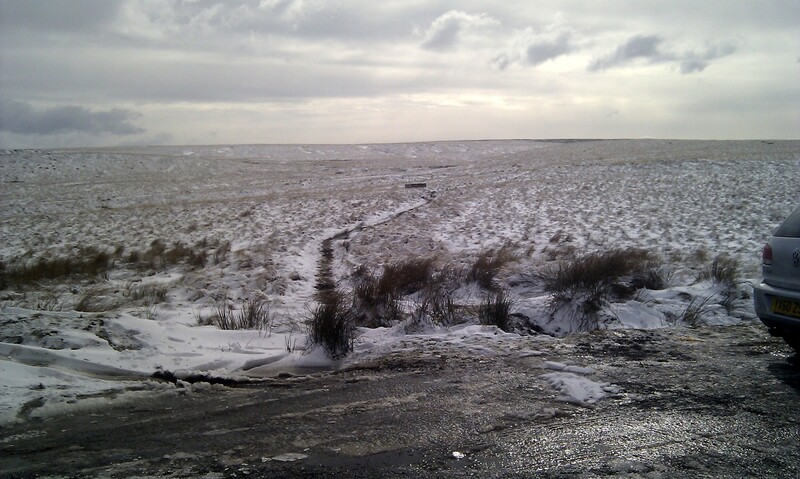 At least 12 runners passed me as I floundered helplessly through the snow covered, energy sapping bog. My attention was soon diverted from the resulting low morale of this error by the freezing gale force wind which side-swiped us as we traversed the dam of Black Moss reservoir and the realisation that my trousers were falling down – I had neglected to tie the waist cord before the race. Why it took me several minutes of fumbling about to learn that it was almost impossible to tie with gloves on I can only put down the hypothermia and altitude sickness. I got annoyed with myself and sped past at least 6 runners before we got to the paved section of the Pennine Way, hoicking my trousers up every couple of minutes. Funny, but I’ve just read my previous account this race in 2010 to find that I sped up in this exact same place on that race too. I think it may be down to the turn in the course which puts the wind behind you – a good thing for us tall fellas as we act like sails in high winds. I wasn’t looking forward to the decent on the paving slabs especially as they were covered in snow and ice. I was planning to run as much as I could on the grass by the side of the path. Once on the slabs I was surprised at how runable they actually were so I stayed on them and flew down gaining a couple more places after the stream crossing at the bottom. Whilst running down this section I got chance to look up and was staggered by the scenery. 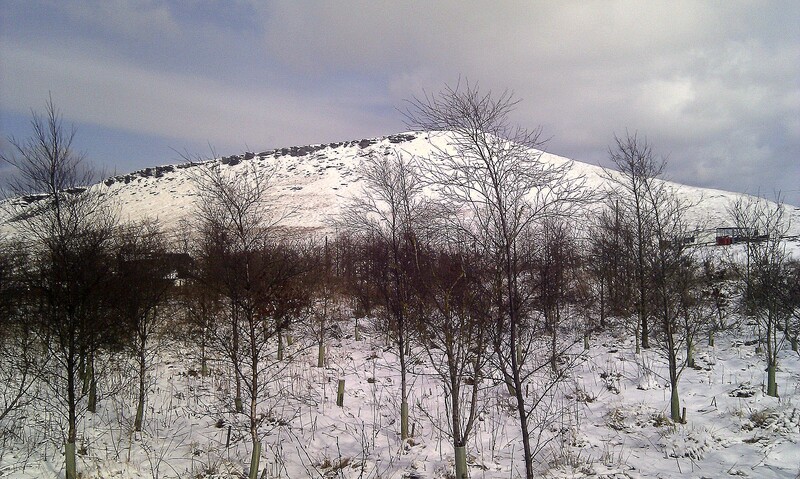 It was beautiful, covered in a layer of snow with the tussocks and other vegetation sticking through the top and the rocks on Pule Hill in clear contrast. I didn’t have time to stop and take a photo so decided I should come back later. Running into the wind almost brought me to a stop as I ascended the Standedge Trail and I was overtaken by 3 strong limbed athletes. I tucked into this group and stayed as close as I could to use them as a wind break (you know what us tall fellas are like in strong winds) until we turned off the trail to head along the catchwater to the bottom of Pule Hill. I could see a steady stream of runners walking up Pule and, anticipating that the wind was going to be a factor, was ready to do the same myself. But I didn’t. I didn’t make any ground on the group in front of me who were walking but I did manage to run all the way up even though my legs had turned to jelly. I was surprised at this point to see a race marshal cheerily urging me on and pointing the way whilst trying to hold the hood of their coat tightly to their head against the wind which was doing its best to blow the poor soul off the hill. Now, I try not to look behind in races – it scares me and and makes me feel under pressure – but at some point I had glanced over my shoulder to see Alistair McDonald not far behind me. I wasn’t making the most of the decent of Pule Hill because of my jelly legs so was expecting to lose a couple of places on this section. By the time I had got to the top of the incline and turned east over the moor and into the wind again I was pleasantly surprised that I hadn’t been. Feeling like one of those young chaps who prefer to wear their trousers with the wasteband around their knees and tiring from the distraction of having to periodically yank my trousers back up I decided to have another go at tying them. I was celebrating the success of this endeavor when came the distinct and inevitable sound of a firmly pinned race number fighting with the weather for its freedom. Not long after I was overtaken by a runner who was travelling at great speed – I decided to let him go. A few minutes later, on the steeper section of the decent, Alistair glided past with effortless speed. This did speed me up a bit but I couldn’t stay with him. By the time we reached the track where we’d started the race he was about 50 meters ahead of me and quickly gaining on a group further in front. After the uneven, soft, spongy decent of Pule this section completely confuses the legs often resulting in them refusing to work. By the time I had got to the road crossing I was glad that it was marshaled. I wouldn’t have cared if there had been a bus coming, I just wanted to get to the finish. For some reason the second ascent of Bobus was slower than the first :-). And I noticed that the 2 runners who had recently overtaken me had started to walk. The marshal at the stream junction which lead us down into Butterley Clough had erected a tent to fend off the weather. This last section is horrible. Most people that do this race can be heard complaining about it. It’s evil. Possibly the worst section of any fell race in West Yorkshire – which of course makes it the best! The deep tussocky terrain and steep decent can turn the hardest of fell runners into quivering wrecks. Today though the snow made it almost a pleasure. And, though I did take a spectacular fall and was barely able to get back on my feet I really enjoyed it. The tracks in the snow also pointed out a far better route than I had ever found on this section before. Even the ascent up the other side of the clough was enjoyable. And even though I’d been overtaken on the descent I was catching Alistair and the group of runners he was now struggling to get passed. On the muddy zig-zag decent to the footbridge several runners made bold moves which nearly ended badly. I decided to stay put. Play it safe. Not take any risks. This, of course, didn’t last very long. I like bold, daring moves. Like…well…throwing caution to the wind and blazing my own trail through bogs. So I knew it wouldn’t be long before I tried something. Just then I spied an opportunity. A small rise next to the path. “If I throw myself at that I can get past most of this group and tuck in behind the two at the front before I reach the bridge.” It only worked! I crossed the bridge with only 2 people in front of me before launching myself up the other side of the gully determined not to lose the places I had so boldly won. By the time I got to the top of the gully I felt quite sick. I had nothing left. Legs and lungs screaming in protest I somehow managed to get myself over the style and start running again. The track – with a wall on one side and young trees on the other – is barely wide enough for one runner and had been turned into thick foot-clawing mud. The chap in front of me was the same runner who had passed me on the decent into Butterlley Clough and had himself performed several daring downhill maneuvers to get there. The chap behind was Alistair. He couldn’t have been more than an inch behind me. He was going to power past me at any moment. “If only I could get past the chap in front. That would put someone between us and it might just put him off.” Finding legs from who know’s where I made a mad dash through a small gap in the trees. I’d done it! I’d got past him. I could see the end 30 meters away! All I’ve got to do is stay on my feet and keep going. I could tell by the faces at the finish line that it was close. I could also tell the other two hadn’t given up. Desperately trying to gulp oxygen from the freezing air I dug in a bit more. Surprisingly my legs responded. I sped up. Forcing myself forward I moved closer to the finish. I went over and ended up on my arse. If there was such a thing as a prize given for the least amount of time spent on the floor after a fall I would have won it. Somehow, without conscious effort I was back on my feet and across the finish line before the other two. Hardly able to breath and bent double trying not to throw up I was thanked for the “great battle”. Unable to speak I responded with pats on the back. The other two, Alistair and (I’ll post his name when I get it from the results) had seen me slip – as the result times show they were inches behind me – and without any communication between them they both decided not take advantage of my misfortune to gain the extra place. That, to me anyway, is what this is all about. And that’s why it was such a great race. I came 44th – my best ever place in this race with a time of 65 minutes and 9 seconds by best ever time. wow i felt as if i was there with you ,i was gasping for air for you, and shivering with cold.in the end i gave up and let you pass me ,as just reading it,knackered me and i havn,t felt warm since,despite adding an extra woolie and stiff drink. darn good read though! great race report and well done! 45th is much better than my latest fell race! 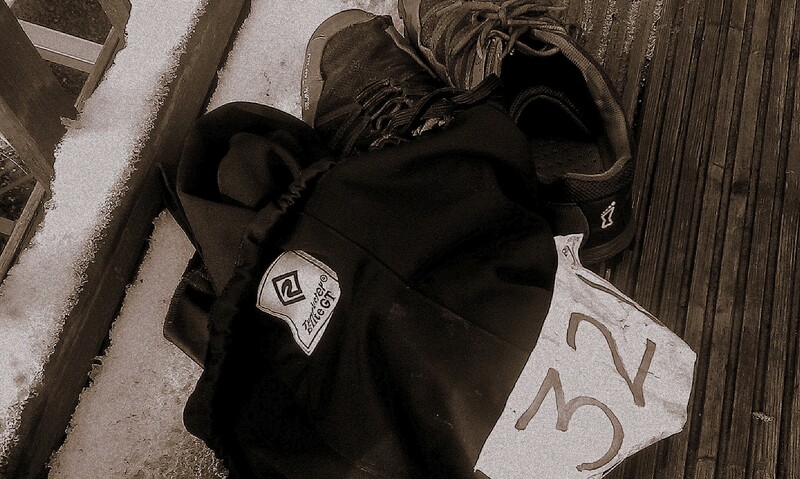 Zen and the art of mountain running.